A small kitchen fire in Suffolk displaced 5 adults and an infant. 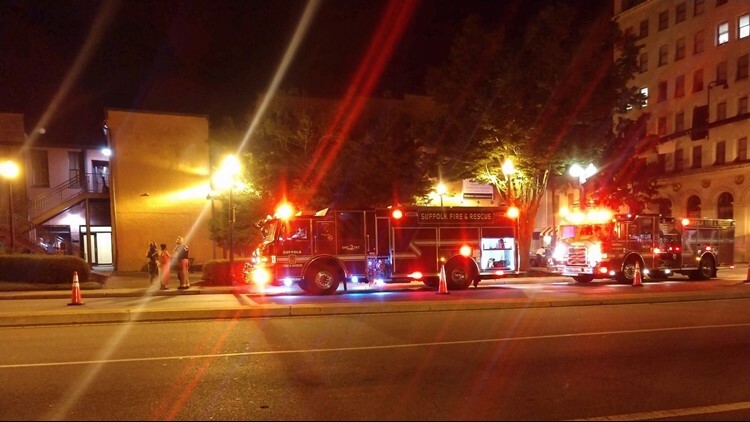 SUFFOLK, Va. (WVEC) — Suffolk Fire and Rescue responded to the scene of an apartment fire on Sunday morning. Emergency Communications received the 911 was around 2:30 a.m. for a fire in the 100 block of West Washington Street at The Lofts at Oce Eleven apartment building. According to Battalion Chief William Kessinger, on the scene, firefighters didn't see a fire. Fire crews entered the building and found a small fire in a kitchen area of one of the apartments. The fire was out before firefighters arrived because of the apartment building's sprinkler system. The fire was considered under control by 3:52 a.m.
Five adults and one infant were displaced due to the fire, and water damage to the downstairs apartment. The American Red Cross will be providing assistance. There were no injuries as a result of the fire. The cause of the fire is undetermined at this time and remains under investigation.